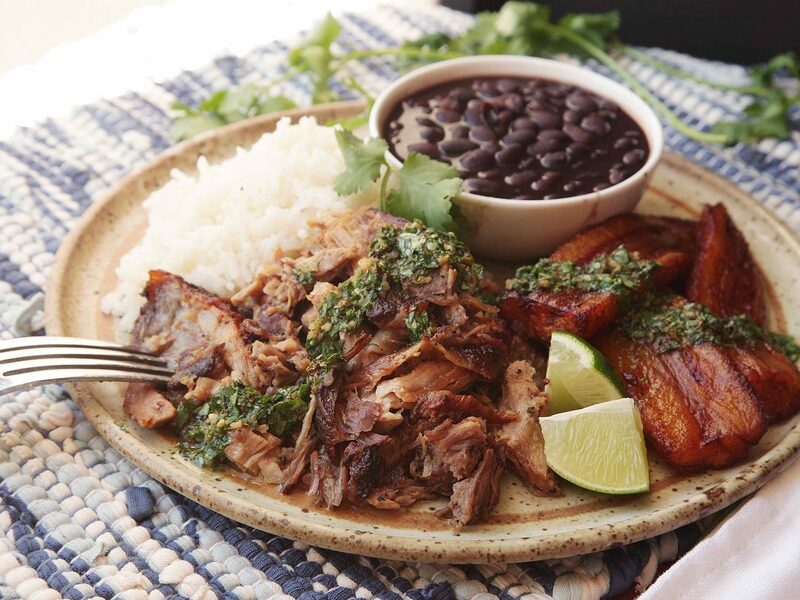 Make the most of wintertime citrus with this simple Cuban-styled roast pork recipe. A fresh mojo marinade is made with a variety of fruit, garlic, spices and olive oil to transform your next weeknight meal. One of the best things about authentic Cuban food is the roast pork. Tangy and tender, it's the perfect dish with rice and beans or even in a sandwich. This Serious Eats recipe comes close to the way I make it at home -- I've simplified it a bit to use a smaller roast and whatever citrus you can find. 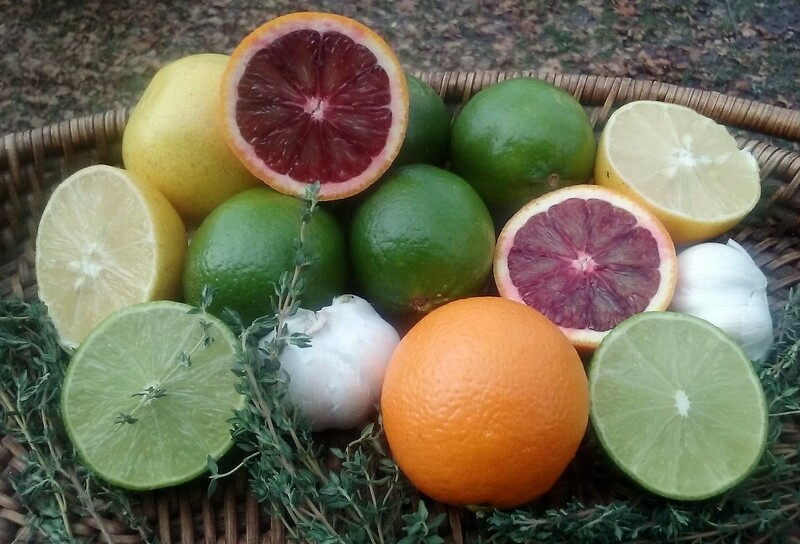 In a mixing bowl, juice your citrus and strain out any seeds. Add your fresh herbs, garlic, and seasonings, then whisk in your olive oil. Add the cubed pork roast and refrigerate for at least two hours. I generally let it marinate in a bag overnight. Preheat your oven to 275 degrees. Line a roasting pan with heavy foil, add the pork, and fold into a somewhat spacious bundle by folding the foil across the top and sides. You can also just loosely cover the pan with a second piece of foil. You want enough room for the meat to steam inside the packet. Cook for two hours, then raise the heat to 350 degrees and open the packet. Continue cooking, uncovered, for another 60-90 minutes. Baste occasionally with the pan juices. The pork is best when it is a bit crisp on the outside, tender on the inside. Let the pan juices cool a bit, and skim off as much fat as you can for an additional sauce. You may want to season it again if you find that the pork is a bit bland. Serve with white rice and black beans, over yellow saffron rice, or in a sandwich like a classic Cuban medianoche. *A sweet lime is like a Meyer lemon -- it is a cousin to the lime that is yellow and very mild and juicy. If you wanted to do the first step of the cooking in a crockpot, it would work just fine. Do the initial two hours of cooking covered, on high. Still finish in the oven, though, for the crispy bits. You don't want to use a lean cut like pork tenderloin for this recipe. You need the fat to make it all work. If you can't find a pork shoulder, you can use boneless pork country ribs. You can increase your portions, but watch your cooking times. Also, if you prefer to keep the roast whole, it will take longer to cook as well. Have you made mojo-marinated roast pork? What do you like to serve with it? Let us know in the comments below. Looking for some healthy veggie recipes to use this winter? Check out these!